I'm doing the happy dance today. We had a wind and rain storm blow over a couple of nights ago, and all my newly planted seeds, bulbs, and bare root plants had the perfect watering. The next day the sun came out and now I'm enjoying the beautiful sunshine in my garden again. March is a busy month at My Cozy Corner. We have some important birthdays, and also this month we have the time change, St. Patrick's Day celebration; The first day of Spring and Easter Sunday. Wow! 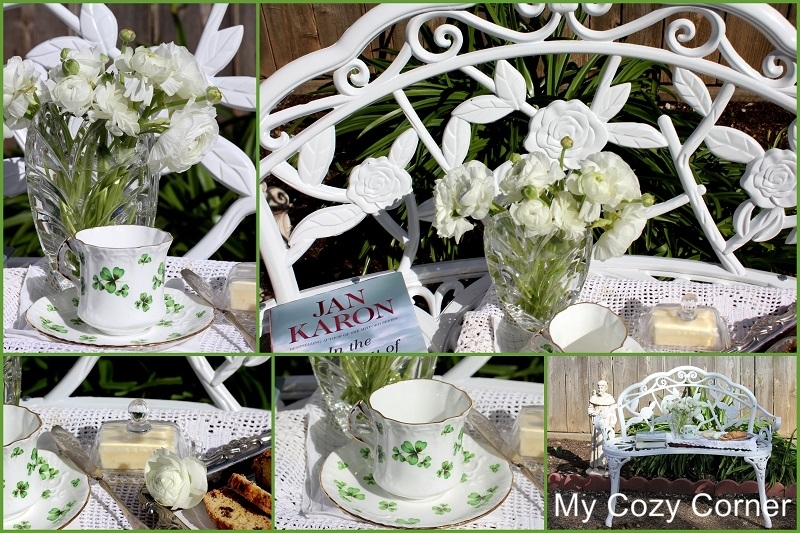 To celebrate St. Pat's Day I have set a little tea party for one on my new bench. I'm so excited to have another seating area in the garden. The beautiful White Ranunculus are from the local grocery store. They were only $4.99. The crystal vase was one of my mother's treasures. Our church is having a St. Patrick's Day dinner and the ladies guild are baking the Irish Soda Bread. I volunteered to make five small loafs of Irish Soda Bread for the evening. Now, there is only four. Irish Soda Bread is delicious with butter, and I love using my vintage butter knife. I have a printable recipe for the Irish Soda Bread. Go Here. As I write this post I'm eating Irish Soda Bread and drinking tea. How fun is that? LOL. I found this adorable cup at a Church bazaar last fall. HAMMERSLEY Fine Bone China, Made in England. I love Jan Karon books. I've read the entire Mitford series, and now I'm reading In the Company of Others. A trip to Ireland would be nice. Have a look at the cute bench I bought at 'Big Lots' the other day. Saint Francis of Assisi has found a home in the tulip bed. He is known as the patron saint of animals and nature. Just perfect for my garden. Another Joyous day @ My Cozy Corner. Thank you for visiting, and please come back soon. I will be joining some great parties and have a link for you to use. Beautiful flowers, great book to read - darling cup and saucer - what more could you ask for! Such a nice flowers and nice combination with green..Welcome Spring..
Wow... I love the cups and your iron wrought sofa. I missed some of our tradition while living in Stockholm. Swedes are not into tradition as we Filipinos (Catholics) do. This will be my next collection... for the next St. Paddy's Day. Thank you so much for inspiring me. Unfortunately, our weather is still freezing and I can't play outside as of yet. Det är mycket roligt att ha fester tillsammans med andra som ni har St Patrik´s day.Där man hjälps åt att fixa mat och kaffe. det ger så fin gemenskap. Koppen du har är så söt.Ranunkler är en av mina favoritblommor. What a lovely post! Your bench is a wonderful find at Big Lots. I love tea and I love your Hammersley teacup and soda bread, too! Happy St. Patrick's Day! I would love to try the Irish soda bread. Your setting was absolutely gorgeous. How lovely! Such a beautiful spot for the pleasing display you've created. I'd love to sit there and take it all in! Betty, I love your flowers and shamrock teacup which has a nice shape. I'm going to compare later, but I think I make the same Irish soda bread recipe but have never put it in a loaf pan. Does the recipe make 1 or 2 loaves? I was thinking it would be nice to make 2 smaller rounds than the one huge one. It's a nice loaf for sharing. Lovely to have nice weather! I love your bench and your china is perfect! Jan Karon's books are a favorite and I really enjoyed that one as well...probably time for a re read! Thanks for the reminder! I haven't made the soda bread in a loaf pan, but was deciding what to make to do with my CB&C...so guess what I'll make???! Thanks for linking to Tuesday Cuppa Tea! Your teacup is so pretty, Betty, and so are your flowers. The Irish soda bread looks delightful! Enjoy! Sorry I wrote this twice, but the first one didn't have my name on it. You can delete it if you like. Your teacup is so pretty; love the shape of it! Your bench is lovely and you do have a wonderful spot to sit in the warm weather. Pretty flowers and lovely looking soda bread too. I am right now reading the first book in the Mitford series and I'm really enjoying it. It's always a pleasure to have you join me for tea, Betty. Happy St. Patrick's Day! What a sweet tea you had outdoors! your precious teacup is so pretty and delicate and your beautiful vase filled with the gorgeous flowers complete the setting. I'm loving having tea outdoors while we are in Florida. Happy St. Patrick's day to you! Beautiful sunny setting for tea in the garden! I love your new bench for a spot to sit and relax with a good book. Your flowers are pretty in your Mother's vase. The Hammersley shamrock cup and saucer is so sweet on the garden bench. Lovely! Love how light and bright this is! A Jan Karon book I will have to look for in the library. I love your new bench! Your pictures are so beautiful and the teacup is stunning. What a delight it must be for you to sip tea from it on your bench in your garden while reading the new book. The Irish soda bread makes the tea time perfect. I love this post. Oh, so beautiful and inviting! The book is on my ipad. I need to pick-up reading where I stopped months ago. Your post has inspired me today! Easter Brunch with the Girls! A Little French Going On!